custom sounds say they're missing but aren't! Discussion in 'Mapping Questions & Discussion' started by darktemplar, Jan 17, 2015. Around the 8th of this month valve finally got around to fixing soundscapes reading from improper soundcaches, but the custom sound play feature is still broken. 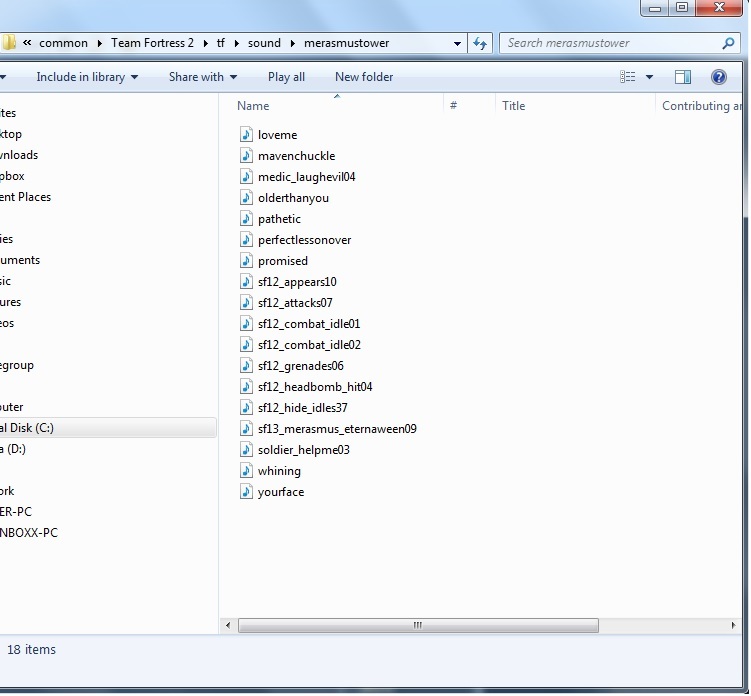 That's a screencap of the exact folder where all the sounds are located and called from. ALL of these sounds worked prior to Scream Fortress 6, but broke along with the soundscapes which are now fixed thankfully. The strange part is, SOME of these sounds will play, and SOME will not. It is very bizarre and annoying. I had the folder titled with a capital M "Merasmustower" and noticed the console referencing it with a lowercase. I HIGHLY doubted that was the case but changed it to lowercase and tested the map again, same result. The map has embedded custom content for soundscapes and custom sounds alike (as well as one custom texture too). The sounds are NOT corrupted or anything. I played a few of the ones it said it had failed to load and they played and sounded perfectly fine in Windows Media Player. Do I need to recompile it so it gets a fresh take on all the new garbage they have put into tf2 regarding sounds behavior? I can't imagine why that would help but it's all I can think of. I am desperate. Any ideas to get ALL of my custom sounds working again? had the same issue before, some sounds playing and some "missing" while they're not. I wouldn't by any chance have to change the path specified in hammer for all custom sounds for this to work, would I? That would require a recompile and me hunting down what is by now probably multiple months old work. iirc I had this issue on a map where I kept the custom sounds locally even though I packed them, and one day this error occurred. I think I deleted them locally and now it works. If you've packed your sounds, then just move the local files to your desktop and see if the issue remains. That didn't seem to do it either. 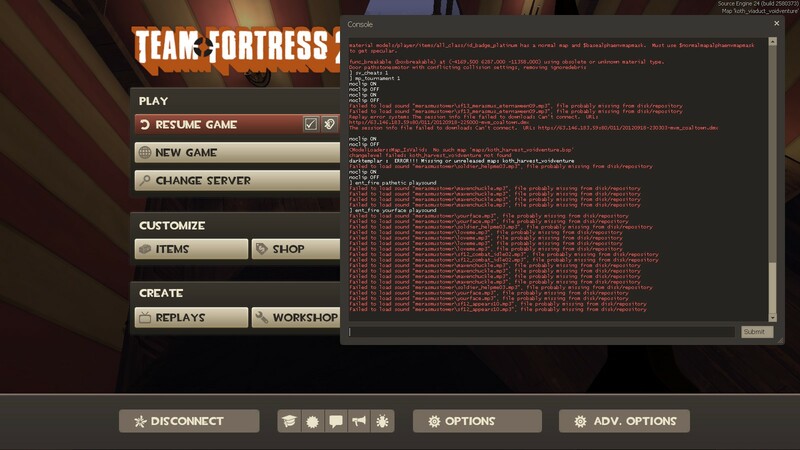 I noticed in the console it said <mapname>.cfg not found, not executing. I never noticed that before. Is that new? Do I need to make a cfg file for it to read that precaches the sounds or something? I don't know what you mean by packed, unless you just mean embedded. I embedded them with pakrat I believe. Moving the entire merasmustower folder to my desktop and that just made ALL the sounds not be found. It's behaving as though the content isn't embedded at all. Edit 2: Nope. Embedded all the necessary files, custom sounds included WHILE the merasmustower folder was in its proper place in the tf sound directory, tested it, same result. Half worked, half didn't. Removed the folder and put it to my desktop with the map still having embedded content, still same thing. Do I need to put the sounds in tf/download/sound/merasmustower and THEN embed them from there? Edit 3: That did not do it either. Strangely enough, it still does the same thing. Some work and some do not. How can that be? embedded sounds still work when embedded from this path? I even tried the same thing from here, removed the sound folder and kept the embedded content in the .bsp and tried it. Still the same thing of half working half not. This is infuriating. I came upon this myself today for the 5th time in my mapping career, decided to really prod at it. It does seem to be an issue with the tf/sound/sound.cache file. If you rename your sound cache with an underscore at the end (to hide it from the game) and then verify local game content to replace the cache file then the sounds work fine again. As far as I can tell from reading the Soundcache VDC page, you may have to rebuild your soundcache with the commands listed there before it becomes active again but it warns that it will take a long time - I haven't tried yet. It seems to be clientside, other people running the map still seem to hear the packaged sounds fine. Still not sure what specifically causes it, but it seems to happen on maps that were the last map you played before exiting TF2. You don't need to verify game cache to make sound.cache files. The game creates them for you automatically when it runs. Although, it doesn't replace the existing files, it adds to them, which can be a problem if you change one of your sound files but keep the same filename+extension. I had a problem where I converted some of my wavs to a lower bitrate to save some space in the BSP, but when I tested the map they sounded quiet and corrupt. I fixed the problem by deleting the sound.cache file inside the directory my custom sounds were living in (I also deleted all my sound.cache files just in case). But to make sure clients didn't have the same issue with my map, I changed my wav files' filenames so that they would be treated as new sounds by the game and cached anew. I imagine changing them to MP3s would have done the same, but I don't remember if I tested that. I tested just now and the sound.cache file I deleted didn't appear until the game was closed. So it might be possible that a game crash could cause a corrupt sound.cache file. My client sound mods dont work unless I pack them as VPK. Maybe it will help converting your sound files to VPK?